A rose by any other name would smell as sweet, but no rose could ever be as sweet as your love. 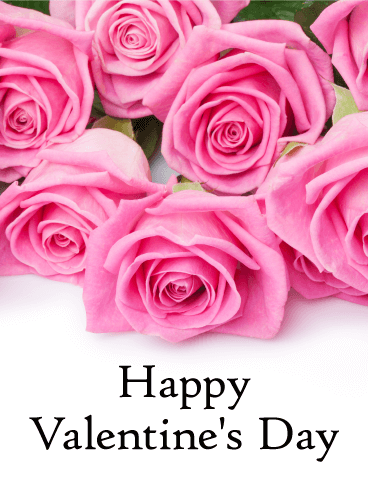 Still, roses are a heart-warming gift to give this Valentine's Day, so use the bouquet of beautiful pink roses on this Valentine's Day card to send your romantic greeting. This sweet gesture will show your significant other how much you care and how special they are to you. Elegance. Sophistication. Romance. 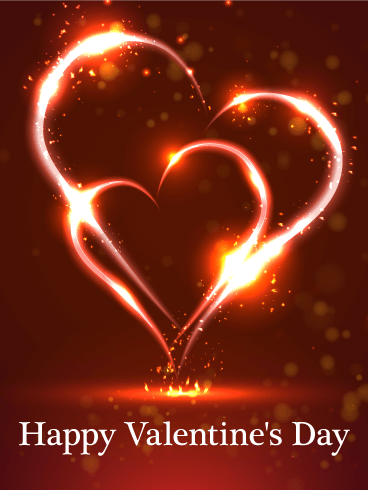 Send a gorgeous Valentine's Day greeting card to your loved to ignite their passion. 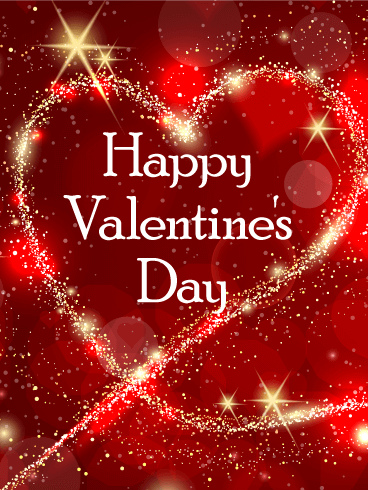 This is the day for extra I Love You's to be said and sweet nothings spoken. Shout your love from the rooftops, or straight to their inbox with this stunning Valentine's Day card. These rich red roses abound in elegant simplicity. The perfect symbol of true love. Valentine's Day is for everyone! Got a secret admirer or just a best friend who deserves some love? 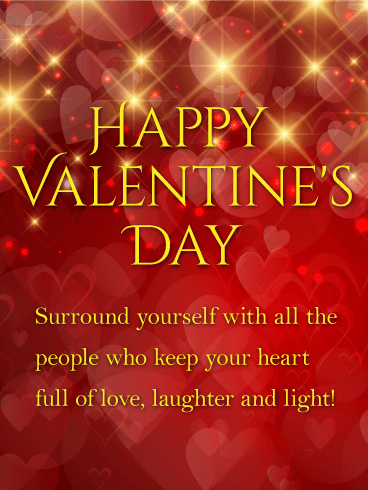 Have fun this Valentine's Day and let everyone special in your life know they are loved. 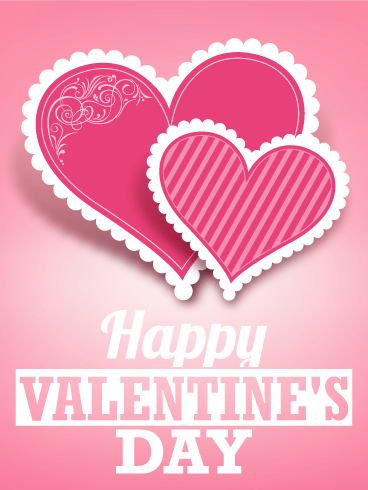 Pretty pink hearts decorated with stripes and swirls make this an attractive Valentine's Day card to send to anyone. Valentine's Day isn't just for lovers-it's for loved ones! Send a pretty Valentine's Day card and spread the love. Let your love sparkle this Valentine's Day! This stellar Valentine's Day card invites you to make a wish on a shooting star with your loved one. Your love is written in the stars and this Valentine's Day card celebrates that. Tell your sweetheart your love him or her with this thoughtful and romantic Valentine. Set your heart on fire this Valentine's Day. Ignite a day of love and let romance be your guide. These burning twin hearts are a dazzling sight and a reminder of the passion you share for each other. 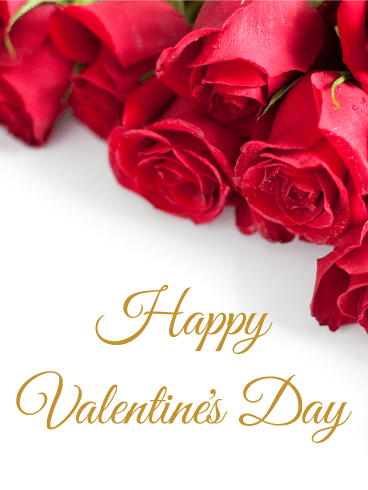 Send your loved one a romantic Valentine greeting to start the day off right. There are many ways to say "I love you," so why not include a passionate Valentine's Day card to the list? 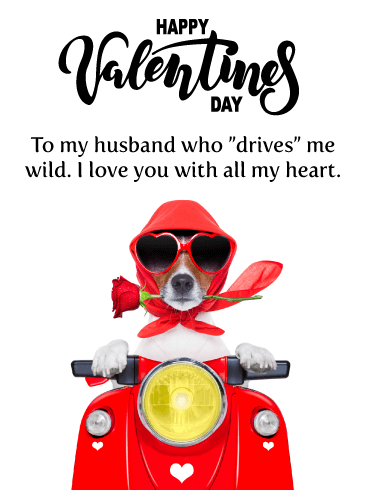 Have a wild and wonderful Valentine's Day! These hip hearts are busting with love. Glossy hearts, shiny hearts, pink hearts, or red hearts-we heart all Hearts this Valentine's Day! You can't say "I love you" better than with this funky and fresh Valentine's Day card. 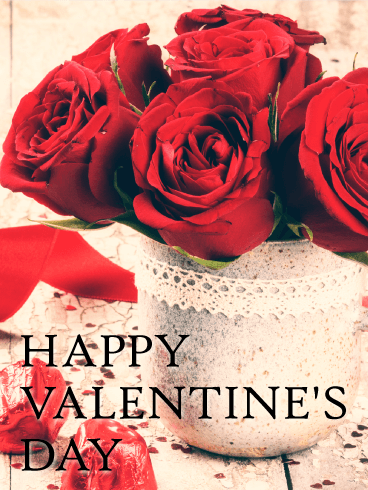 It's a special day, so don't miss out on the chance to be playful in your love and gush about how great your Valentine is! Red roses symbolize true love. Why not send these gorgeous red blooms to someone you love? 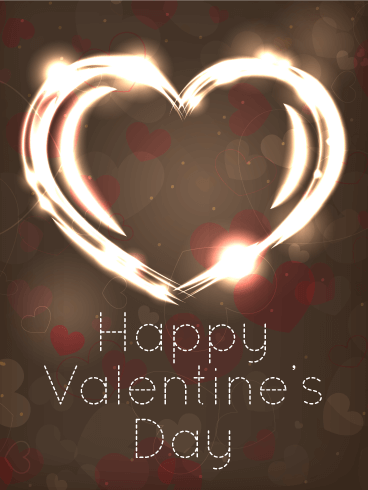 If you have a special Valentine, ignite their love with a beautiful Valentine's Day card. Make Valentine's Day romantic with a bouquet of fresh roses in a lace-covered pitcher sent right to her inbox. There are many ways to say I Love You this V-Day, but few are as thoughtful as a perfectly picked greeting card. Hearts entwine and beat in perfect rhythm together. This Valentine's Day send a card rich in love and beauty. The golden twin hearts entwine to remind you of your deep and abiding love. You sustain each other through all of life's ups and downs. Your love is stronger than ever, so celebrate how far you've come and send a romantic Valentine's Day card. Let your soul mate know how much you adore them with this heartfelt Valentine's Day card. Va-va-voom! This heart beats only for you! Let your Valentine know they are the only one for you with this bold and sassy Valentine's Day card. A perfect, red heart is simply the best. 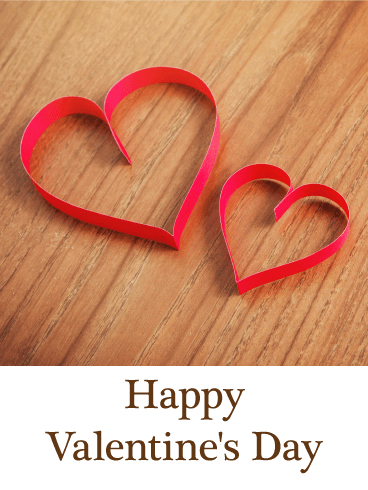 It is the classic Valentine that we all look forward to on this lovebird day. 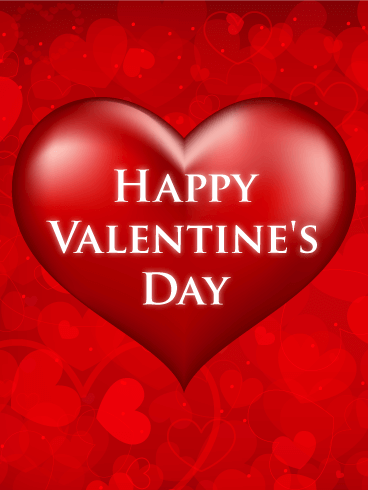 Send a big red heart on V-Day to a lucky someone and show your passion once and for all! A precious and simple V-Day card. How sweet are these paper twin hearts? Just like it's easy to make a paper heart and spread some love, it's easy to send a special Valentine's Day card too! Who's your Valentine this year? Let them know it with this sweet Valentine's Day greeting card. 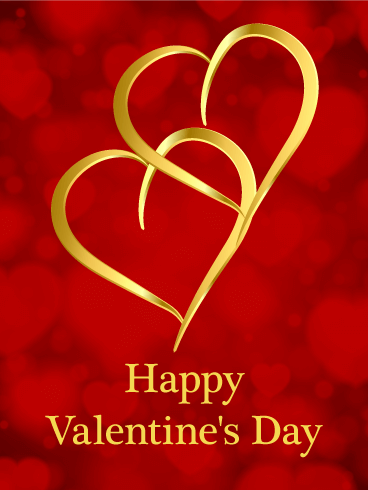 With one big heart and one little heart, it's a great Valentine to send your child to remind them how dear they are to you. Look at you glow! Love lights us up from the inside out. Celebrate love in all its many shapes and forms this Valentine's Day. 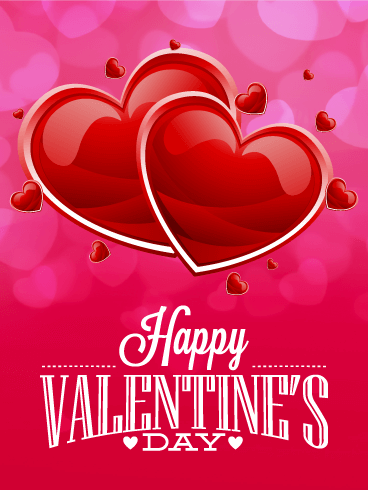 Send a unique Valentine's Day card for your special someone! This glowing heart lights up a backdrop of sweet red and white little hearts. The font is reminiscent of a pretty embroidered stitch, so it's really just a perfect Valentine's Day card for anyone!